Are you going to put me to sleep? 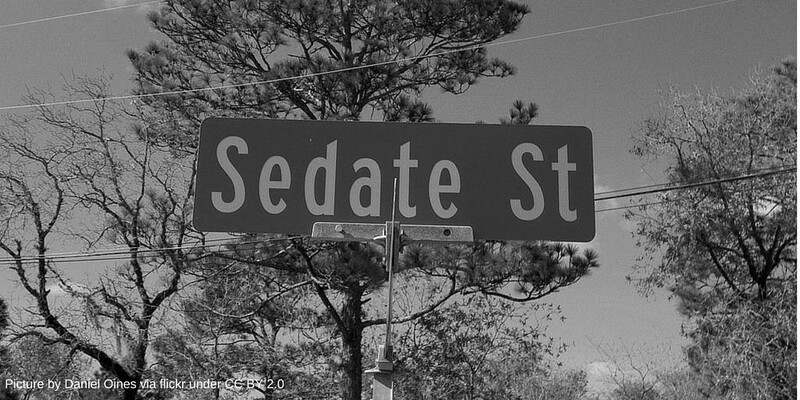 what are the risks of sedation in the emergency department? Doctor, what are my risks? It all started with a conversation with a resident almost 3 years ago. And I was not able to summarize these risks accurately…and yes…it took more than 2 years since the first literature search to the publication of the review, so we had to re-do the search to update our results a few times. Systematic reviews are at the top of the evidence-based medicine pyramid for a reason: they summarize all the pertinent available literature; however when well conducted, they involve a lot of resources, particularly a lot of time. We evaluated the incidence of adverse events in adults undergoing procedural sedation in the ED. An expert librarian (Pat Erwin) performed the search and found more than 2,000 titles for review, and of those there were 55 relevant articles, with data on adults and published after 2004. This meta-analysis included 9,652 sedations. The most common adverse event was hypoxia, with an incidence of 40 per 1,000 sedations, followed by vomiting with 16 per 1,000 sedations and hypotension with 15 per 1,000 sedations. Severe adverse events requiring emergent medical intervention were rare, with one case of aspiration in 2,370 sedations (1 per 1,000), one case of laryngospasm in 883 sedations (4 per 1,000), and two intubations in 3,636 sedations (1.6 per 1,000). Agitation and vomiting were higher with ketamine. Apnea was more frequent with midazolam. When propofol and ketamine are combined, the incidences of agitation, apnea, hypoxia, bradycardia, hypotension, and vomiting were lower compared to each medication separately. Table 1 has the overall incidence of adverse events, and is what we use as a “pocket card” every time we will sedate a patient in our ED. 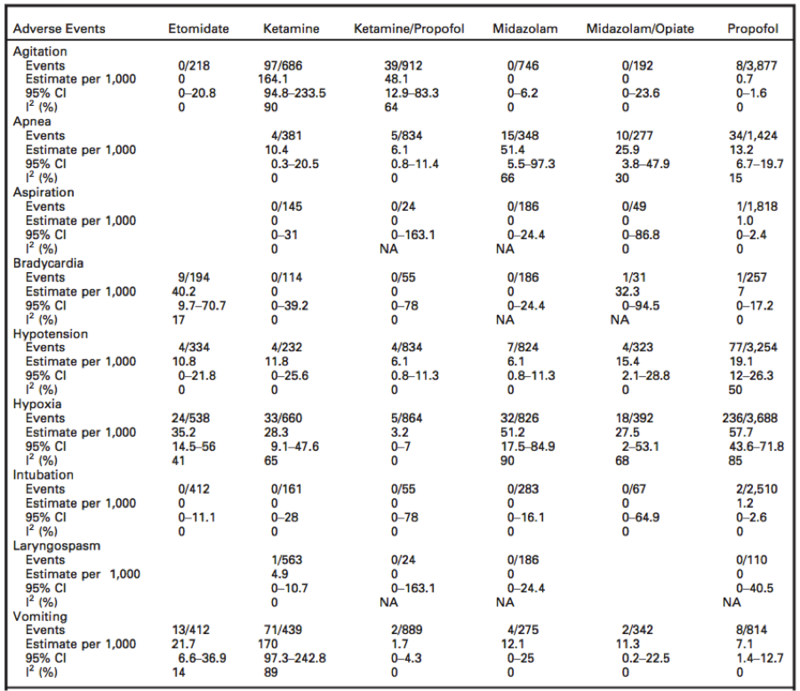 Important note for readers not familiar with meta-analysis: You will see that the numbers of the estimate per 1,000 are not the proportion divided in the “events per sedation” column, example laryngospasm 1/883=1.1 and not 4.2, however a meta-analysis pulls the estimates within and across studies. Also note that not all the adverse events recorded in the articles were clinically important, for example most episodes of hypotension resolved spontaneously and did not need interventions like fluids or vasopressors. Table 2 gives you the specific adverse events by medication or medication combinations. Serious adverse events during procedural sedation like laryngospasm, aspiration, and intubation are exceedingly rare. This review will help clinicians and patients to improve risk communication, informed consent and shared decision making. What about shared decision making? We need to differentiate inform consent from SDM. The numbers provided in this paper will help the clinician to inform the patient about his/her risks, and in some cases will be used for shared decision making, for example if we are planning on doing a sedation with ketamine and the patient says it is very important for him/her not vomit, then maybe we should change the medication plan to propofol. The ones that make more physiologic sense for a particular patient (example will avoid propofol on a patient that is hypotensive). I do not think we are ready yet for a “restaurant menu” with medications for the patients to choose, particularly because procedural sedation in the ED setting is never an elective procedure (think orthopedic reductions, cardioversion, endoscopy, etc), and when I discuss the medication choice with my patients, most are already distress with the “final procedure” (the successful joint or fracture reduction, the cardioversion, the foreign body removal, etc) and I have found that most of them will want us to help deciding. Become familiar with the adverse events of the medications you use regularly. You can use table 1 for a more “general” approach to adverse events in procedural sedation in the ED, or you can use table 2 if you want specifics by medication. You can add few minutes of the consent process to ask your patient what are the things important for them regarding the sedation. Special thanks to Chris Carpenter and Kathleen Seal from Academic Emergency Medicine making this article a successful one.